The Jerusalem Post featured the story of 4 Shluchim and their families who live in the ‘mountain time’ states and are among few Jews and face many challenges. Raizy Mendelsohn, who codirects the Chabad of Jackson Hole, Wyoming, with her husband, Rabbi Zalman Mendelsohn. Jackson Hole is far from the thriving Jewish communities in Toronto and Ramat Beit Shemesh where she was born and grew up. There is no regular morning prayer service during the week and sometimes not even on Shabbat, except during the busy summer tourist season. The closest actual mikvaot are in Salt Lake City, Utah, and Bozeman, Montana, which are both five hours away in the few months when there is no snow and up to 10 hours during blizzards. But Mendelsohn has no complaints. Raising three smiley daughters aged five and under and with another child on the way, she is the picture of contentment living in a place where a moose moving into her front yard is par for the course. 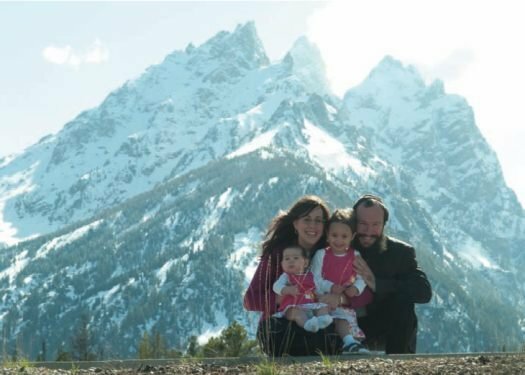 While South Florida, where Zalman was raised has Chabad houses every few blocks, he is the only full-time, resident rabbi in the state of Wyoming. He started visiting Wyoming regularly as a teacher at Chabad’s rabbinical college in Morristown, New Jersey. As a rabbinical student, Mendelsohn visited Nepal, Beijing, Singapore, and Bali in Asia. But in 2007 he asked for and received a lifetime appointment by Chabad to make his home in Jackson Hole, an old western town with a ski resort in a national park. Mendelsohn estimates that the town has “500 Jewish souls,” the overwhelming majority of whom are intermarried. He also services some 40,000 Jewish tourists a year who visit, including hundreds of Orthodox Jews. There is no synagogue yet in Jackson Hole, but Mendelsohn is receiving donations and he believes it will soon become a reality. Meanwhile, he conducts Shabbat services at his home in the winter and a hotel in the summer and always has many guests at his table on Friday night. There are synagogues without rabbis in even smaller Jewish communities in Cheyenne, Casper, and Laramie, Wyoming, the latter of which has a small Hillel Jewish student center at the University of Wyoming. Mendelsohn visits each city four or five times a year, officiating at weddings and funerals and helping Jews observe Passover, Hanukka and other holidays. “We are here to serve every single Jew with our hearts and souls, doing whatever it takes,” he says. “We know we are on the front lines. Mendelsohn describes his goals as both mundane – “just helping a Jew do another mitzva today” – and lofty – “making the world a better place.” His surroundings in the mighty Teton mountain range on the edge of Yellowstone Park create a special environment for both mundane and lofty aims. “The Tetons are the most dramatic mountains in the Rocky range,” he says. “The mountains unearth the soul, and we feed it Judaism. Seeing me here has the same shock value as finding Chabad in Nepal. Like the Mendelsohns, the six Lifshitz children go to school on the Internet with peers around the world, thanks to a unique online education system run by Chabad. There are twice as many Jews in Boise as Jackson Hole, but no Jewish life, except for the store-front Chabad and a 100-year-old Reform/Conservative temple that prides itself as the oldest continuously used synagogue west of the Mississippi. After meeting in New York, Brooklyn-born Mendel and South African Esther married and moved to Boise in 2004. Mendel did Jewish outreach before that in more than 30 countries as a rabbinical student. He served for three years as assistant rabbi at The Shul of Bal Harbour in Miami, the largest Chabad outreach synagogue in the country. One disadvantage to the Lifshitzes’ efforts to build up a Jewish community in Boise is that when families become more religiously observant, they move to cities with Jewish schools and kosher restaurants. But the rabbi, who was raised in Cincinnati, says there are Jews who would be lost in a city saturated with Jewish life but receive full attention in such a small community. “In Idaho there are very few Jews, but someone has to be here on the ship to look after the stragglers,” he says in an interview in his synagogue office. Part of leading small Jewish communities is relating to their Jewish brothers and sisters and setting an example for them. To that end, Chavie Bruk goes skiing in a skirt and takes her two toddler daughters Chaya and Zeesy to yoga, ballet, and gymnastics, while her husband Chaim goes hiking and rafting with men from their community. The outspoken Bruk downplays perceived difficulties in living in Bozeman, Montana. He says trucks come monthly from Minneapolis to deliver him meat and any kind of kosher food he wants, which he stores in his seven – yes seven – freezers. Chaim boasts that he was raised at the feet of the Lubavitcher Rebbe, Menachem Mendel Schneerson. He spent several years leading community outreach in Russia, Canada and Israel. Chavie is the daughter of the Chabad rabbi of San Antonio, Texas, and also did outreach to Jews across the US and around the world. When Chaim spent two summers in Montana as a yeshiva student, he built up relationships with local Jews, and when he saw that the Jewish population in Bozeman was growing, he received a blessing from Chabad headquarters in New York in 2007 to buy a house and set up shop there. 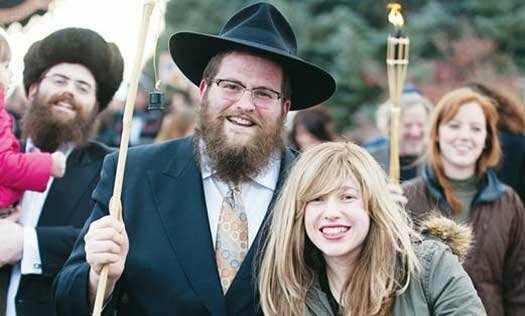 Montana does have small Reform synagogues all over the state, including in Bozeman, whose members Bruk says he services in ways only Chabad can provide. “I wish all the Jews would have been educated by the [Lubavitcher] rebbe so they would love each Jew with a non-judgmental approach,” he says. “If secularist Jews loved religious Jews the way Chabadniks love secular Jews, the world would be a better place. There is a minyan at the Bruks’ home almost every Shabbat morning and weekday services when people have a yahrzeit, anniversary of a loved one’s death, or a special occasion. But Chaim says praying with a quorum was not nearly as satisfying as praying with a man in his seventies who recently put on tefillin for the first time, three weeks before he died. The Bruks believe there are approximately 5,000 Jews in Montana, spread out over a state that is the US’s fourth largest and is almost as big as California, which has dozens of Chabads. They chose to focus on Bozeman, because it is the state’s fastest growing and most centralized city, but they also service other cities and held seven events with close to 400 people around the state during Hanukka. After building a state-of-the-art mikve in their home and inaugurating two Torah scrolls, the Bruks are now raising funds to build what they are billing as Montana’s first and only Jewish Community Center, which will be their synagogue. Meanwhile, he endures jokes from his Chabad rabbi colleagues when they get together for their annual convention in Crown Heights. “I can handle their moose jokes, and if they saw the mountains of Montana, they would have a different opinion,” he says. The Zippels are considered pioneers by the Bruk, Lifshitz and Mendelsohn families. They have been in Utah for more than 20 years, at first serving all four states from Salt Lake City before mentoring the younger families when they came. “My first reaction when I was told to come here was ‘what is Utah?’” Benny says, in an interview at his home. “I’m Italian, and my wife is Canadian. We had no idea what continent Utah was on. Besides their synagogue, the Zippels main endeavor is Project HEART, which stands for Hebrew Education for At-Risk Teens. Shortly after they arrived in Utah, the Zippels received a call from a Jewish parent in California, who told them about his son who was sent to a treatment center for troubled teens in Utah. They met more and more Jewish teens at such centers, which have grown in Utah because the local legislature does not require a child’s consent to be sent there. Over the years, the Zippels have worked with hundreds of Jewish teens from all over the world and all different backgrounds who suffered from drug addiction, depression and eating disorders and whom conventional education gave up on. They talk to the kids about their lives, Judaism and its role in their recovery. Rabbi Zippel holds weekly discussions with as many as 200 teens on the weekly Torah portion, the Jewish mystical perspective on current events, and what Judaism says about anger management. He also attempts to reconcile the teens’ strained relationships with their parents via a nonjudgmental, all-accepting approach. The Salt Lake City Chabad has services on weekends at its large synagogue and regularly brings in kosher food from California. The Zippels have raised six children in Utah, all but one of whom have already left town, starting in high school. “The only time I felt it was a sacrifice to live here was when I sent my first kid away to school,” Sharonne Zippel says. “I remember saying ‘just because we live in a Godforsaken place, why do our kids have to suffer?’ But my husband said ‘they aren’t suffering. It’s what the rebbe wanted.’” At first Zippel went to workshops on home schooling at the annual Chabad women’s convention. Now she teaches the workshops and mentors young peers in isolated places.